If you are an agency with clients, you can share your Popup Maker account with your clients, so they can have specific access to the service. You can create Sub-Accounts in your Popup Maker account and allow your clients to use the service with the privileges you provide them with. How to Set up and Control the Sub-Accounts? Billing - the user can make payments and see the billing information with this permission. View Statistics - the user will have access to the Statistics section and track the popup statistics with this permission. Create/Edit Popup - the user will be able to create and edit popups if this permission is selected. View Subscribers - the user will have access to the Subscribers section of the account with this permission. View Contacts - the user will have access to the Contacts section of the account with this permission. Autoresponder - this permission will provide the user with ability to create and control the Autoresponder option in the account. Newsletter - this permission will allow the user to create and send newsletter emails to the subscribers. *You can select the privileges for the user, creatin a custom role for the sub-account. 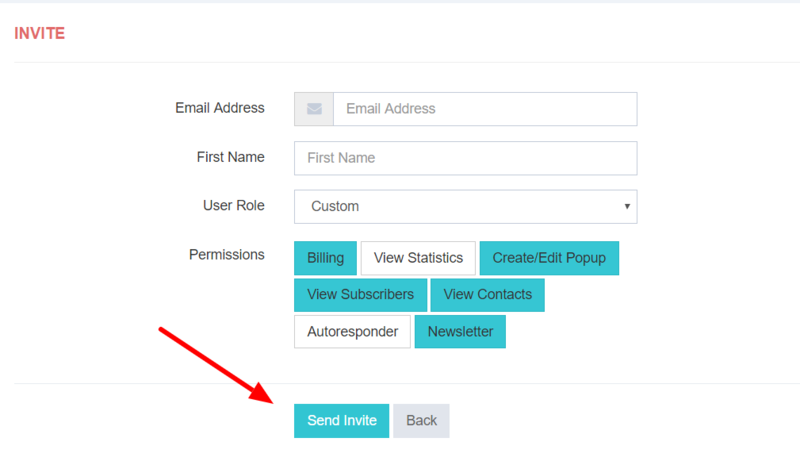 As soon as the details are set up, you can send the invitation email to your user, simply clicking on the Send Invite button. The user will receive your invitation email and approve it. How to Remove a Sub-Account? All the sub-accounts are stored in the Sub-Accounts section of your control panel.